The scene begins in Heaven. Jesus is sitting at his desk. The phone rings. JESUS: Oh hi Lu. What can I do for you? SATAN: We need to talk about that fancy new IT system you installed. The one that decides who’s been good a good boy and who gets to spend an eternity with me. It’s on the blink again. SATAN: Yes, again. There’s yet another do-gooder down here. You promised to sort this out the last time it happened. We don’t want another Nelson Mandela incident on our hands, do we? JESUS: Look, I’m terribly sorry. But there’s no need to be all dramatic. Mr Mandela was very understanding in the end. Mistakes happen. SATAN: Well they shouldn’t. I thought you were omnipotent. 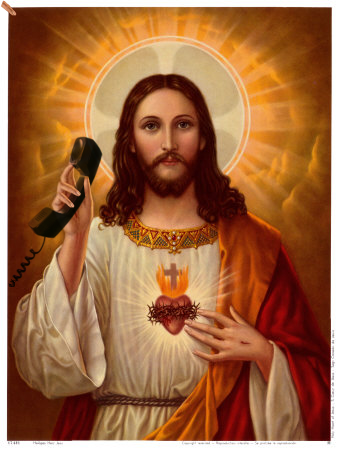 JESUS: No, that’s my Dad. SATAN: I thought you were your Dad. JESUS: Don’t get me started on that whole trinity thing. I’ve needed decades of psychiatric help just to try and establish who the heck I am and how I feel about my father. Dr Freud says it’s a classic case of Oedipus Complex, which is odd considering God doesn’t even have a mother. SATAN: I don’t care about any of that. I just want this mess sorted. The guy who showed up here has devoted his entire life to helping the sick and the poor, and now he’s kicking up a stink because he’s found himself at the gates of Hell. What am I supposed to do with him? JESUS: Send me his details. My people will get onto it. If it’s a mistake I’ll send one of my angels down to pick him up. In the meantime, isn’t there somewhere nice you can put him up? SATAN: Nice? NICE? Do you think we have hotels down here? Well, actually, we do, but the rooms are all infested with bedbugs, the internet is lousy and expensive, the showers have only cold water, and the air-conditioning doesn’t work. JESUS: That doesn’t sound so different to many of the hotels above ground. SATAN: Did I mention that one of my demon vassals goes from room to room flaying all the guests and using their skin to make designer shoes? JESUS: Well that doesn’t sound so nice. Look, where is this guy right now? JESUS: Hang on, Rolf Harris is still alive. What’s he doing down there? SATAN: You tell me, Mr I’m the Lord of All Creation. Get your stupid IT system sorted out, will you? JESUS: I will, but can you at least return Rolf for me? He’s supposed to be in court. He’s an old man. You’ll have him back soon enough. SATAN: Will I? So he’s guilty then? JESUS: As to the matters before the court, I have no idea. I was thinking more about his musical crimes, which are unforgiveable. SATAN: So what are you doing to fix this problem? JESUS: I’m talking to Talent2, the people who developed the system. SATAN: Aren’t they the same people who built Novopay? JESUS: Tell me about it. SATAN: Then get Steven Joyce onto them. JESUS: No way. I don’t want Steven Joyce anywhere near my eternal kingdom. Could you imagine what he would do with the place? He’d consolidate all my operations into a single bloated and inefficient super-ministry of God, while mouthing buzzwords about business growth and innovation. And things would just end up getting worse. No thank you very much. We don’t generally innovate up here. I prefer us to do things the old-fashioned way, which is why I regret installing this stupid computer system. SATAN: The old ways are the best, that’s for sure. I thought you really lost something special when you closed down your Department of Smiting. JESUS: Believe me, Lucifer, that wasn’t my idea. But the brand consultants I engaged said consumers were being turned off by all that Old Testament stuff. I sure do miss those days. SATAN: Have you talked to your lawyers? Can you sue the developer? JESUS: Come on, Lu, this is Heaven. Seriously… where am I going to find a lawyer? SATAN: Well, this is your mess, and it’s affecting business here. So fix it fast, will you? I told you this would happen. I told you we would have these problems. But you promised me the new admissions software would streamline the process. Instead I’ve got saints filling my furnaces, while some of my most valuable sinners are ending up on your doorstep. What am I meant to do? Why can’t we just go back to the old ways? People could just sell their souls to me, and they wouldn’t even need to be entered into your stupid system. JESUS: Don’t make this out to be worse than it is. The majority of the deceased are ending up where they should, and the rate of processing errors has been declining in recent weeks. The vast majority of our clients report no problems with the system. Sure, some people might not like the fact that they’re going to burn in the fires of Hell for all of eternity due to a processing error, but we’re really only talking about a small number of affected clients. And if the people wrongly consigned to Hell’s horrors report those errors we’ll fix them up. SATAN: But it’s hard to report an error when you’re swimming in a sea of lava, screaming in terrible agony as your flesh melts, while at the same time your eyeballs are being pecked out by giant demonic birds. JESUS: That’s just another excuse. Honestly, people will always find something to complain about. SATAN: Just tell me you’ll sort this out. JESUS: I’ll do my best. But I have a lot of other projects on the go. Those natural disasters don’t happen on their own, Lu. And all those miracles take time to organise. SATAN: Have you got a miracle planned this weekend for the English rugby team? JESUS: Even if I did have one planned, I’d hardly tell you, would I? Besides, I don’t have much to do with the English rugby team. Evil deeds are your area, not mine. Speaking of which, I have to say a big well-done with the cricket. It’s disgusting and disgraceful what you’ve done to that once-great game, but kudos to you. I always have a lot of respect for a job well done, even if in this case it leaves me feeling utterly sick. Tell me, what are your plans for Chris Cairns? Is he really the villain in all of this, or just some innocent chump you’ve managed to ensnare? SATAN: Oh, I have big plans for Chris Cairns. Wait and see. JESUS: Tell me! Come on! SATAN: Tell me first whether Labour wins the 2014 election. JESUS: HA HA HA HA HA! HA HA HA HA HA! SATAN: Wait, why are you laughing? JESUS: HA HA HA HA HA! HA HA HA HA HA! HA HA HA HA HA! HA HA HA HA HA! HA HA HA HA HA! HA HA HA HA HA! HA HA HA HA HA! HA HA HA HA HA! HA HA HA HA HA! HA HA HA HA HA! HA HA HA HA HA! HA HA HA HA HA! HA HA HA HA HA! HA HA HA HA HA! SATAN: What’s so funny? I thought you were a miracle worker.